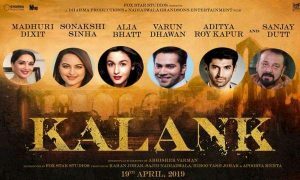 Kalank is a period drama movie directed by Abhishek Varman who has earlier helmed 2 States. The movie is co-produced by Sajid Nadiadwala, Karan Johar, Hiroo Yash Johar, Apoorva Mehta under the banner of Nadiadwala Grandson Entertainment, Dharma Productions & Fox Star Studios. The period drama is set in 1945 in the pre-independence British era. The film is very close to Karan Johar as it was conceptualized by Johar and his father Yash Johar around fifteen years ago. Madhuri Dixit as Bahaar Begam. 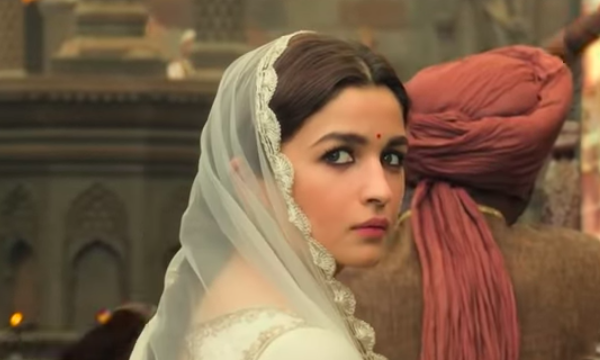 Alia Bhatt as Roop. Roop loves Zafar but is married to Dev Chaudhary. Sunjay Dutt as Balraj Chaudhary. Sonakshi Sinha as Satya Chaudhary. Aditya Roy Kapur as Dev Chaudhry. Kriti Sanon special appearance in a song. Before the release of the teaser, a series of posters introducing the characters of the movie were released on social media. Besides these, other posters were also released as the part of the film’s promotion. Have a look at the posters of the movie. The teaser of the movie was released on 12 March 2019 and received good response from the viewers. The audience loved the intensity of the characters, grand sets and Arijit’s voice in the teaser. It has so far received 41 million views on Youtube. Kalank trailer released on 3 April 2019. However, it received mixed reviews from critics and viewers. In no time, it becomes a meme material on social media. A certain section of the audience loved the trailer while the other wasn’t very much pleased with it. The trailer has so far received 24 million views on Youtube. 4 videos songs of Kalank have been released. Kalank music composed by Pritam while the lyrics are penned down by Amitabh Bhattacharya. Ghar More Pardesiya: Sung Shreya Ghoshal and Vaishali Made. First Class: Sung Arijit Singh and Neeti Mohan. Kalank Title Track: Sung by Arijit Singh. Tabaah Ho Gaye: Shreya Ghoshal. There is no denying that Kalank is one of the most anticipated movies of the year. However, it failed to create the expected pre-release buzz. The trailer of the movie received mixed reviews from the viewers. Kalank will release on more than 3000 screens in India. With the current buzz and other factors, I am expecting the film to take a decent start at the box office. Kalank is one of those films, which can backfire if rejected by the audience. If totally accepted, Kalank will definitely cross 150 crore mark at the box office. However, Kalank will find it difficult to enter the 200 crore club.